In any event, you don’t need to travel to Austria or northwestern Italy to enjoy these bread dumplings. They are quite easy to make at home. The technique is a bit like making potato dumpling or gnocchi, but actually easier. These bread dumplings are much less prone to becoming stodgy as gnocchi can be if not made right. And it’s a great way to use old bread, a nice change when you’re not in the mood for a bread soup like ribollita or pappa al pomodoro. Toss together in a large bowl the bread and speck (if using), then add the eggs and milk and parsley. Mix together. Let the mixture rest for a good 20 minutes or so. The bread should be rather moist at this point, but not soaking wet. If you find the mixture a bit dry, then add more milk. Mix in the flour, along with the onion and parsley. (NB: For added flavor, you can sauté the onions in a bit of butter before adding them to the mix.) Season well with salt and pepper. Form the resulting ‘dough’ into balls about the size of golf balls. By the way, if the mixture does not hold together, or if you notice that it is exceedingly wet, then add more flour, a bit at a time, until you find that the mixture has reached a nice dough-like consistency that will hold together well. Now bring a pot of well-salted water (or, for a richer taste, broth) to a gentle simmer. 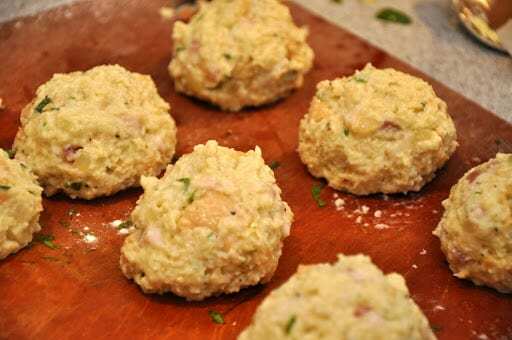 Add the canederli, one at a time, with a slotted spoon—or just use your hands like I usually do… If you are not experienced with making these dumplings, just form one ball to begin with, and try simmering it. If it falls apart, then you know you need to add some more flour to your mixture. Then try again with another. If all goes well, then add all the rest. Simmer the canederli for about 15 minutes. They should have come to the surface of your simmering liquid, much as gnocchi do. 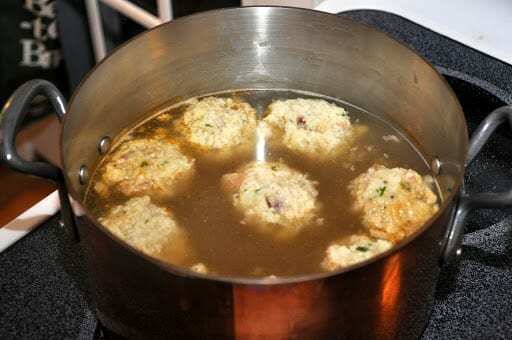 There are various ways to serve canederli. The simplest is the way I had them at that wonderful meal in Bolzano: in a rich, homemade broth—a kind of Italo-Austrian matzo ball soup. My personal favorite way to enjoy canederli is to accompany them with a creamy mushroom sauce as pictured above, the same kind of sauce that goes so well with potato gnocchi. Also very good, and very popular in Vienna, is to serve them with beef goulash, which I hope to blog on some time quite soon. Unlike pasta or gnocchi, however, you do not generally pour the sauce over or mix it with these bread dumplings, but rather lay down a ‘bed’ of your sauce and lay the dumplings on top. They are big enough that you will need to cut them into bite-sized pieces with a knife and fork, using your fork to fare la scarpetta as they say in Italian: dip each piece of dumpling in the sauce. You can also make one big dumpling of the bread mixture, by forming a loaf and wrapping it in cheesecloth before simmering it. Of course, this big bread dumpling will take a bit longer, say 20-30 minutes, to cook. You serve it sliced like a meatloaf. 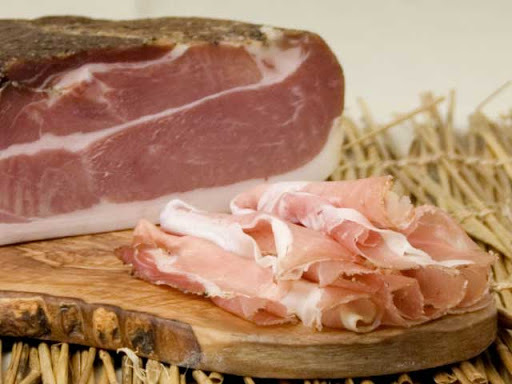 Speck is a smoked pork product that is common to Austria and this part of the Italy. It is quite delicious but can be hard to find. Feel free to substitute prosciutto or even slab bacon if you like, or omit the meat altogether, as I often do anyway. In any event, the region today still retains much of its Austrian heritage, notwithstanding the best efforts of Mussolini, who ‘shipped’ in many Italians, especially from southern Italy, to colonize and, to his mind, ‘civilize’ the place. There is, in fact, a triumphal arch built by Mussolini in downtown Bolzano, the capital of the area, to celebrate the Italianization of the area. It is still the object of the occasional sabotage attempt, or so I was told when I visited, although the region was granted considerable autonomy after the Second World War. And when I was there in the late 90s the place seemed as tranquil as any I’ve ever been to. Besides beautiful scenery and great food, they make wonderful wines, including the popular Pinot Grigio, but also some excellent Chardonnays, Riesling, Sylvaner, Gewurztraminer, and Kerner. It’s well worth a visit. I was so excited to find this site today! 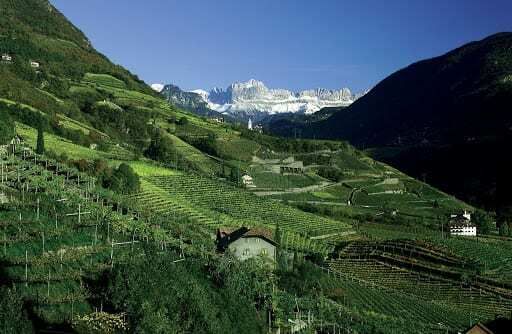 My family originally emigrated from the Austrian Tyrol in the very early 1900’s. Canederli was always made for holidays after they “got settled” here, mainly Thanksgiving and Christmas. I believe both my Nonnas used luganiga in place of speck. My mother (although she was NOT a good cook!) made awesome canederli ! She even made her own broth with chicken backs and wings, onions, and celery. All my aunts on both sides were phenomenal cooks—–we often joked that each one of them could make a meal for twelve out of a cinderblock and three napkins! They also made awesome canederli. That whole generation is now “cooking in Heaven’s kitchen”, and I really miss those days! So very happy to get this recipe today (as my mother was never willing to share hers!!). I’m so happy this recipe brought back so many wonderful memories for you, Barbara! Although I didn’t eat canederli growing up—only got to know them when I moved to Europe—I do recognize the rich family cooking traditions of that very special generation. Making these dishes is a way to keep those memories alive! If you prefer the Knödel less soggy, a great tip is to bake your canederli mixture in a buttered cake tin (like you would use for a Guglhupf/bundt cake) in the oven. Instead of adding whole eggs to the mix, seperate the eggs, add the yolks to the mix and beat the egg whites into stiff peaks and fold them carefully into the mix, before tranferring it into your greased tin. Baking instead of “poaching” will give it a crunchy crust, but wait for about 10 minutes before removing the Knödl-Guglhupf from the tin to let it set. Cut into cake-like slices and enjoy with your roast and gravy- very delicious and your guests will be very impressed when you present the mysterious cake and cut it at the table. If you would like the precise recipe, I will gladly submit it. Thanks for your great website and love of detail, I often come back to research Italian recipes! Dear Tanya, I would love your recipe. Thanks very much …In anticipation. My Mom used to make thees for me and now she is gone and today I suddenly had a taste for it! Thanks, folks, for all your wonderful comments, which mean a lot to me. Ah, knödel are dear to my heart so of course I am a big fan of this. I didn't realize they were also an Italian specialty, but I am not really surprised. You really need to eat them when you know you'll be doing a LOT of walking!! So I just had to open this post from Foodbuzz when I saw the title and I'm glad I did! It sounds just wonderful – a lot of work, but I'm sure well worth the effort. Thanks for educating us on this dish! I would have them simply – in broth – so that I can taste everything in it. These are wonderfully new to me and I will be investigating. Hope your holiday season has been splendid. I totally love your blog and yor recipes. I just want to note that over here in Germany “Knödel” are potato dumplings. The ones you made are called “Grammelknödel” the ones without meat “Semmelknödel”. The best thing about them is to cut them into slices the day after you made them and to roast them in a pan. By the way: After floating to the surface they should start turning, that is how to see whether you formed them well. I love these bread dumplings! I haven't had them in a while, though. Thank you for sharing the recipe – I will definitely get to them. I love your recipes! The cooking instructions are wonderfully relaxed and easy to follow. They make me feel as if I heard them standing in your kitchen! But what makes it all so special is the story behind it all, the history, the geography, the family anecdotes..
My family came from Trieste so this is a familiar dish to me but one I haven't had in a long time. Thanks for the reminder….. I would prefer to eat these bread dumplings with your mushroom sauce, too. Looks awesome!